BBQ season is here and YUM’s gettin hotter! Take your sweaty sunburned self down to Asiento this Friday night to get it on. 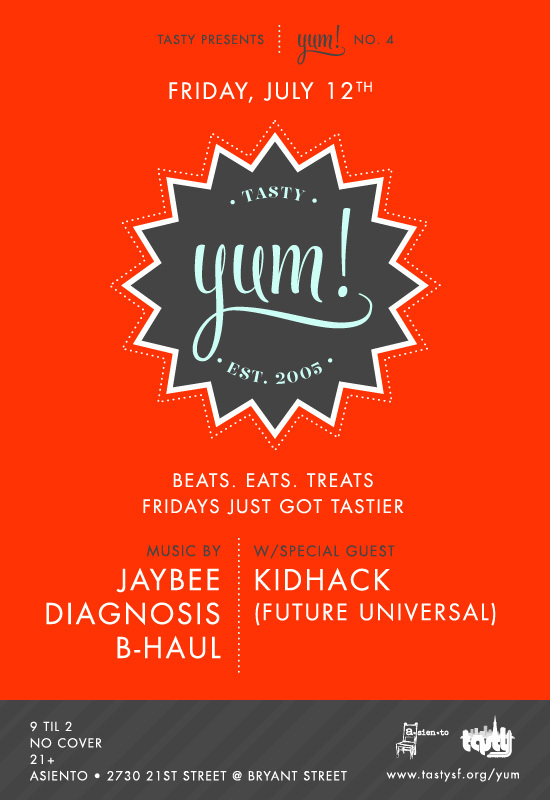 Special guest Kidhack’s gonna set it on fire with a Tech House set and residents B-Haul, Diagnosis, and Jaybee will lay down our secret marinade of herbs and spices, tech and bass, electro and hip-hop. Spread it wide and far! 2730 21st St. @ Bryant St. This entry was posted in B-Haul, DJs, Events, jaybee, yum! and tagged bhaul, deejay diagnosis, event, events, jaybee, music, SF, yum on July 9, 2013 by Amit Verma. it’s time to… TASTY AND CHILL.